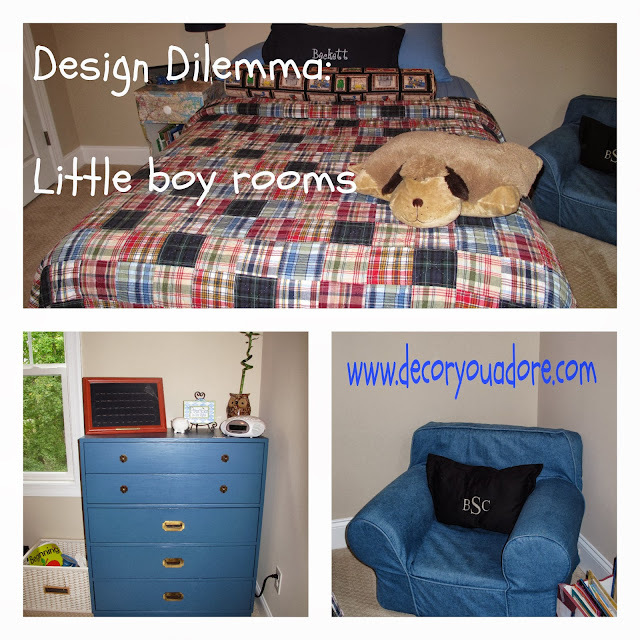 Decor You Adore: Design Dilemma: A Little Boy's Room to Adore? I gave you a peek into our daughter's room a few weeks ago. It was such a fun space to work on. But, the adorable son is feeling a bit left out. It is small but plenty of room for a 5-year old. However, while visiting Jacki's beach house this summer, both my children decided they wanted bunk beds in their rooms--arrrrgh! Thankfully, my husband and I are adept at manipulating helping our children see reason. What little boy wouldn't right?? That bad boy is $2,000 at Pottery Barn Kids. Yikes!!! Definitely not in the budget-no matter how awesome it is. After some internet obsessing research, I found this uber-awesome site, that gives you detailed, step-by-step instructions (shopping lists too!) on knocking off this piece and hundreds more. So my hubby was planning on breaking out the power tools. That all seemed like a great compromise (except for those overflow guests that would be scaling a ladder in the middle of the night). Then my lil' man found out that Daddy couldn't lay down with him in a twin size bunk bed. My son is IN LOVE with his Dad (ya know, I totally get it!) so that was a no brainer for him. A week at the beach in bunk beds is a treat, but night in and night out without Daddy "sleeping with you"...um, no thanks! I like the paint color (Sherwin Williams Kilim Beige) and the comforter and custom made valance that we used in our last house. That is, in fact bamboo sticking out of an owl's head. Is that quintessential little boy or what? 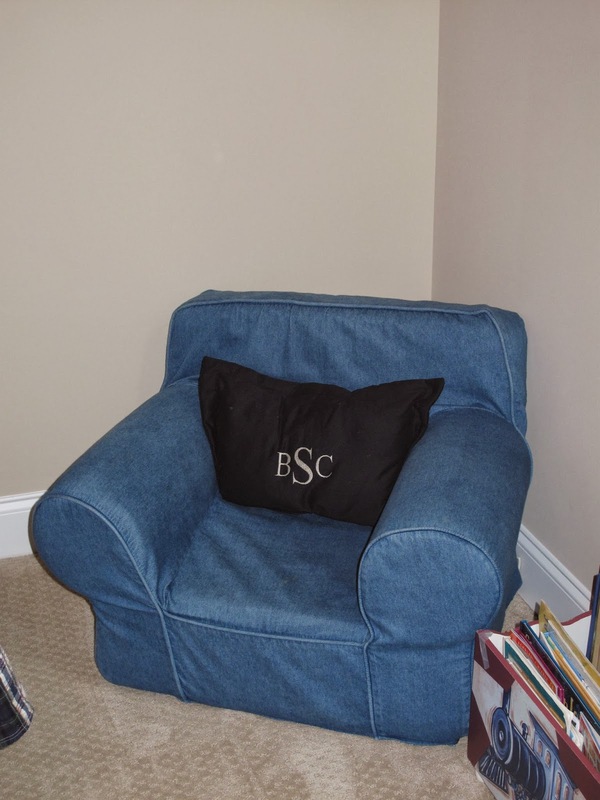 He has this chair from Pottery Barn Kids and uses it for reading. Personally, I could take it or leave it but he wants it, and it's cute, so why not? 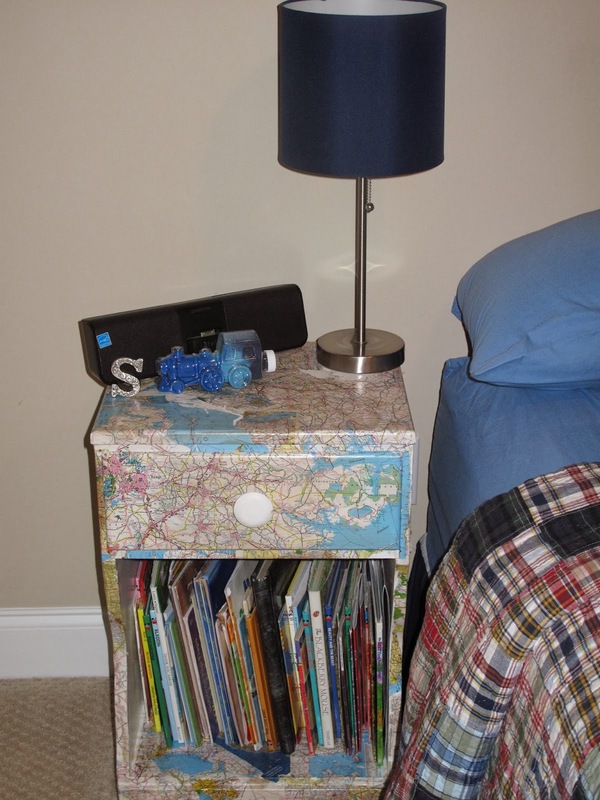 Here's a hand-me-down night stand that has GOT to go. He was so desperate to have a letter in his room, he stole my "S" paperweight from the office. 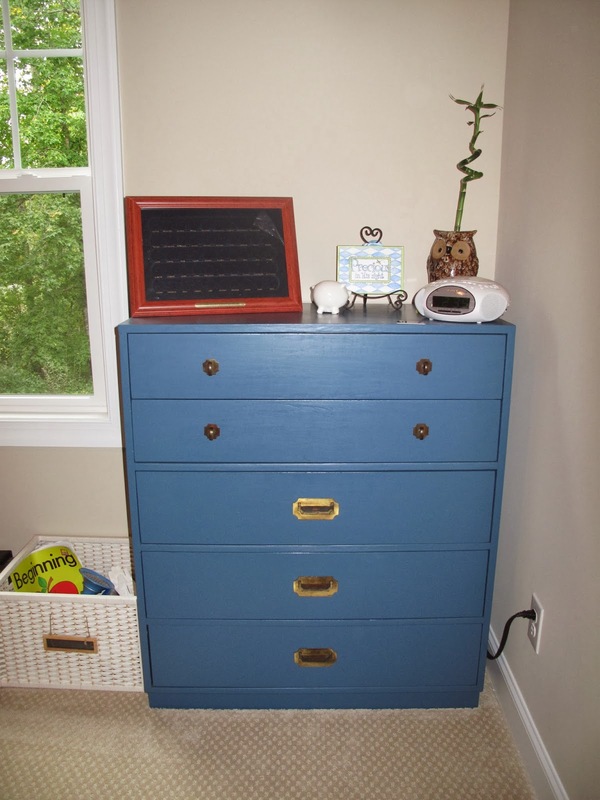 I was thinking maybe a campaign night stand to match the dresser? The aforementioned 5-year old would like to see his room painted "red, white and blue". His kindergarten class just finished their patriotic/American History chapter so I suspect that is the inspiration for this Americana decorating scheme. I'm here to tell you THAT is absolutely NOT going to happen. 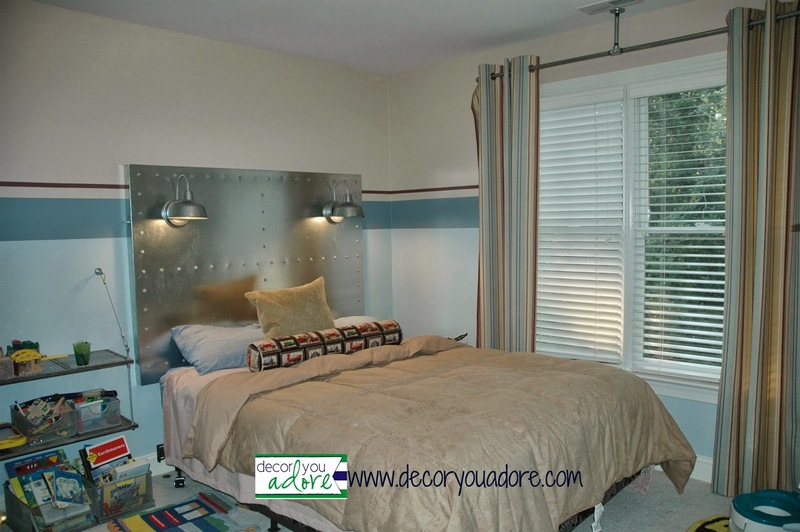 But, I'm thinking I can meet him halfway with a wide navy stripe painted around the room. And possibly a thinner red stripe on top of that. Now here's where it gets tricky! It is a small room so I don't want an actual bed, just a headboard. What kind do you have for a boy? Let me assure you that pinterest has been ZERO help in this department. I didn't even remember the stripes in this room! Inspired! 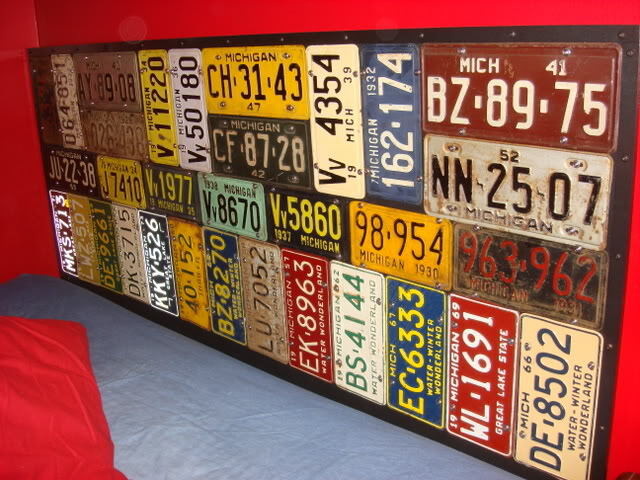 Of course Jacki has another headboard in mind for a different son. She got a ton of different license plates off eBay and is just waiting for the handy hubby to have time to put her plan into action. 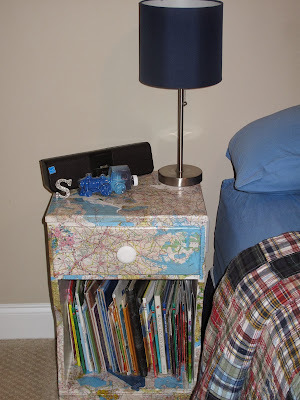 So, I want to keep the bedding and add a thick stripe to the walls with a new nightstand. No clue what I'll do about a headboard... And, I definitely want a creative way to display his name since he's so into letters and spelling. And, I will have to negotiate the wall art. Daddy bought him a Minecraft poster that he REALLY wants to hang-ugh!!! I'd love to hear your ideas. Do you have any suggestions for something creative yet not too expensive? I really like that comforter and the stripe idea would be great. Also, you definitely have to have letters. Thank you for dropping by my linky party. Have a great week! Thanks Nicole! I forgot to say that the comforter was a CL score--of course!